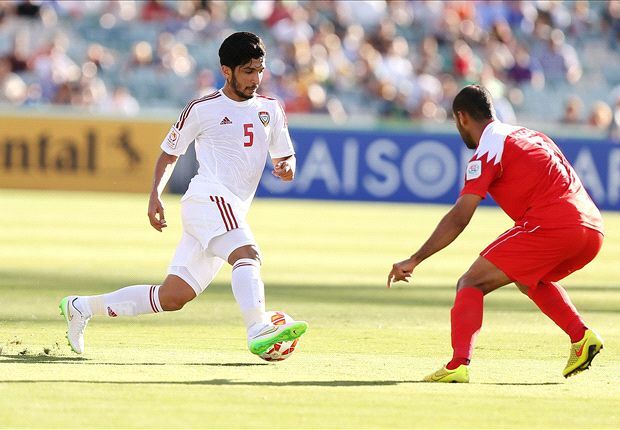 United Arab Emirates took a giant step towards qualifying for the quarter-finals of the Asian Cup as they edged out Bahrain 2-1 at Canberra Stadium on Thursday. UAE made it two wins from two games in Group C courtesy of a helping hand from Bahrain captain Mohamed Husain, who glanced a header past his own goalkeeper with 17 minutes remaining in Canberra. The Emiratis stormed out of the blocks, taking a sensational 15-second lead through leading striker Ali Ahmed Mabkhout, only for Nigerian-born forward Jaycee Okwunwanne to equalise in the 26th minute in Australia's capital city. But UAE, who routed Qatar 4-1 in their opening fixture, preserved their 100 per cent record after Husain could only direct his attempted clearance beyond a helpless Sayed Jaffar, virtually ending Bahrain's campaign. Fans in Canberra had barely taken their seats when the UAE took a swift lead. After dispossessing Abdulla Omar, Omar Abdulrahman picked out Mabkhout, who squeezed a shot underneath Jaffar at the near post to make it 12 goals in 10 matches for both club and country. Bahrain slowly worked themselves back into the contest, with Abdulwahab Al Malood and Okwunwanne both attempting shots on target. The see-sawing battle continued as Ahmed Khalil struck the post in the 16th minute following a piece of individual brilliance from Mohamed Abdulrahman, 60 seconds after forcing Jaffar into a save from a free-kick. Bahrain caused plenty of problems for UAE's defenders throughout the first half and their persistence was rewarded in the 26th minute, Okwunwanne levelling via a thunderous header from a corner. He came close to giving Bahrain the lead three minutes later but UAE keeper Majed Naser was up to the task, pushing a header away for a corner. The crowd in attendance were spoiled for entertainment with Omar Abdulrahman and Mabkhout linking up again 12 minutes before half-time, though the latter's effort was cleared off the line. Both teams struggled to reach the lofty heights of the first half after the interval. The first real chance of the second half fell to the feet of Omar Abdulrahman on the hour mark, with his indirect free-kick clipping the top of the crossbar. Bahrain were eventually breached with 17 minutes remaining as captain Husain glanced a header past his own keeper. Try as they might, neither side could add to the scoreline despite a couple of chances before the full-time whistle.